"I found an egg!" 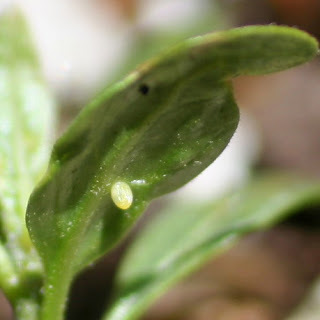 If you found yourself a little creamy-white egg under a milkweed leaf, then you have probably found yourself a Monarch butterfly egg. In about four days, a caterpillar is going to hatch and soon, you will be watching the life-cycle of the gorgeous Monarch take place. In the wild, only about two to five caterpillars that hatch from the hundreds of eggs a mama Monarch lays actually make it to adulthood. "But, why?" you ask. In the beginning, the little caterpillar (larva) is prone to a lot of harsh elements and may die naturally. Predators may eat it. Parasites may lay eggs on it. It can get a bacterial or viral infection from its environment. Lots of things can happen. So, what can be done to help get that caterpillar to adulthood? 4. clean the frass (poop) out every day. If you can remember these things, then you should have a butterfly completing its life-cycle in a month's time! Once you've got your supplies ready then you are set to go. Knowing some basic facts is useful. A young Monarch caterpillar doesn't eat much. One leaf is about all it will eat but be sure the leaf is fresh. Cleaning out the frass (poop) is important. Old frass can get moldy fast and mold is unhealthy for a caterpillar. Be sure the leaf you give is from a Milkweed plant that has had NO pesticides added to it or around it! Even a teeny bit of pesticide can kill your caterpillar! 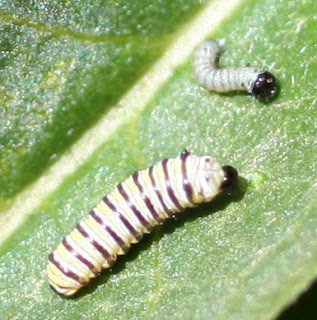 Monarch caterpillars remain in the larva stage for about two weeks. They will eat and poop and eat and poop and eat and poop until they get to be about 2" long. You will find that your caterpillar will all of a sudden stop eating and seem to be dead or just resting. Do not worry when this happens! It means your caterpillar is probably getting ready to molt (shed its skin). This can take 24 hours or more. Don't worry...the caterpillar will begin eating again soon. Just give it time. Leave it alone during this time—it will soon begin to move again when it is ready! Patience…patience…and remember, don't TOUCH! Soon, it is time for the caterpillar to pupate. This is when the larva is about 2" long (you will know...it has gotten really fat!). Put a square of toilet tissue at the top of the container. This will provide something for the Monarch to pupate on. Monarchs pupate hanging upside down. 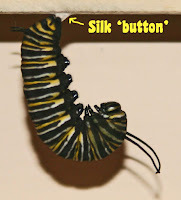 Soon, the caterpillar will form a 'J' by making a silk pad onto the toilet tissue square. When this happens, eating will stop. Do NOT move or touch the container. This is a time that is when the caterpillar will go through its last molt. It is fascinating to watch, if you are able to see it! The last thing you will actually find in the container will be the exuvia containing the head capsule (you can actually see the caterpillar's head!). Sometimes this will be connected to the chrysalis. 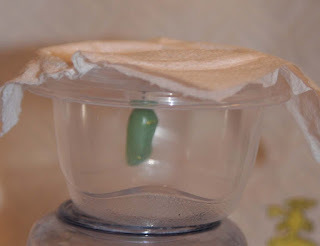 A gorgeous green chrysalis will soon be on your toilet tissue. It will look like a jade jewel. Two weeks will goby...and during that time, your pupa is undergoing metamorphosis. The caterpillar 'dissolves' into a liquid where it is changing completely into its butterfly shape. A butterfly goes through complete metamorphosis. You will be able to see its wings within ten to twelve days. It is a good idea to go ahead and take the tissue OUT of the small container and place it into a larger container at this time. 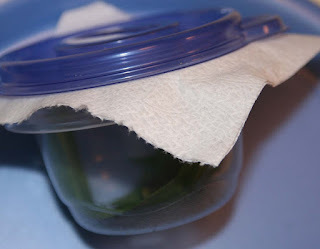 Tape the tissue into a larger jar or a screened area. This will permit the butterfly space to spread and dry its wings when it ecloses.